The 2011 Cholmondeley Pageant of Power (15-17 July; www.cpop.co.uk), will play host to one of the UK's biggest gatherings of World Rally Championship cars this year. Over 30 rally cars will be at the Pageant, and all will be undertaking high-speed runs on the Pageant's brand new, purpose-built tarmac 'Rally Stage'. Crowds will get to see the cars reach speeds of over 100mph on the straights, and then drift in wild and spectacular fashion through the corners. Most of the cars that will appear at the Pageant are from the legendary Group B era (1982 to 1986), which featured some of the quickest, most powerful and most technically sophisticated rally cars every built. The Group B cars became infamous for their extreme speeds, and for a series of major accidents - some of which were fatal - which led to the series being banned. Amongst the entrants on the Pageant's Rally Stage will be the 1983 Audi Quattro A2, perhaps the most famous Group B car. The Audi Quattro A2 turned the rallying world upside down when it made its debut in 1981, thanks to its then-unique four-wheel drive layout which gave it unbeatable traction on loose surfaces. Winning the WRC in 1982 and 1984, in its ultimate guise the Audi Quattro produced a massive 650bhp. In a similar vein to the Peugeot 205 T16, the Metro 6R4's diminutive shape hides a potent 3.0-litre V6 engine with upwards of 350bhp. Despite the 6R4 never achieving the success of some of its counterparts, its diminutive shape and knife-edge handling made a lasting impression on Group B, while its bespoke 3.0-litre V6 engine went on to even greater things. It was eventually modified and used to power the Jaguar XJ220 - the world's fastest production car between 1992 and 1994. Other rally cars confirmed for the Pageant will include: 1982 Porsche 911 SC; 1986 Ford RS 200; 1967 Morris Mini Cooper S; 1988 Ford Sierra Cosworth;1979 Fiat X1/9 Prototipo; and the famous 1992 WRC Martini Lancia Delta Integrale Evoluzione. 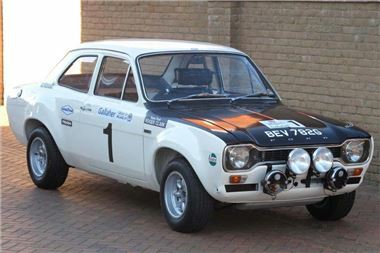 James Hall, Event Director for the Cholmondeley Pageant of Power, commented, "To have these Group B monsters here - on our very own rally stage - is a fantastic addition to the Pageant for 2011. These outlandish cars are particularly welcome, as they epitomise the noise, power, speed and spectacle that make the Pageant so popular." "With track, airborne and waterborne displays, it is just a natural step up to provide Pageant of Power visitors with the ultimate in off-road entertainment. It's a display they won't be able to see anywhere else," added Hall. The Pageant is located in the Cholmondeley Estate in Cheshire, and was created to celebrate power and performance in its many forms. Winning the Best Tourist Event in Cheshire, and drawing in more than 50,000 visitors in 2010, the Pageant of Power has fast gained a reputation that makes early booking essential. Ticket booking details and further event information can be found at www.cpop.co.uk .